In case you are new to this blog we are a camping family :) and we love to take a furry friends with us where ever we go. As a mom to 3 dogs we always are walking, feeding and watering at least one of them. The hard part about being out camping is space available to us. Recently I was given the chance to review a great new item that has saved us space. The Ruffbowl attaches on to most large sized retractable leashes easily giving you a great place to store food, potty bags or just have ready for that time your furry friends needs a drink. I love that is holds 4.5 ounces making it large enough for any friend to drink from. My large dog Roy was a little bit afraid of it at first but now he loves to drink from it. My little dog Koda LOVED drinking from it, being that he is always thirsty I suppose this is a good thing! It was so funny though because my puppy Sparky thought it was a great toy, if there was food in it he would of course eat the food but if there was water in it he thought it was a cool toy! 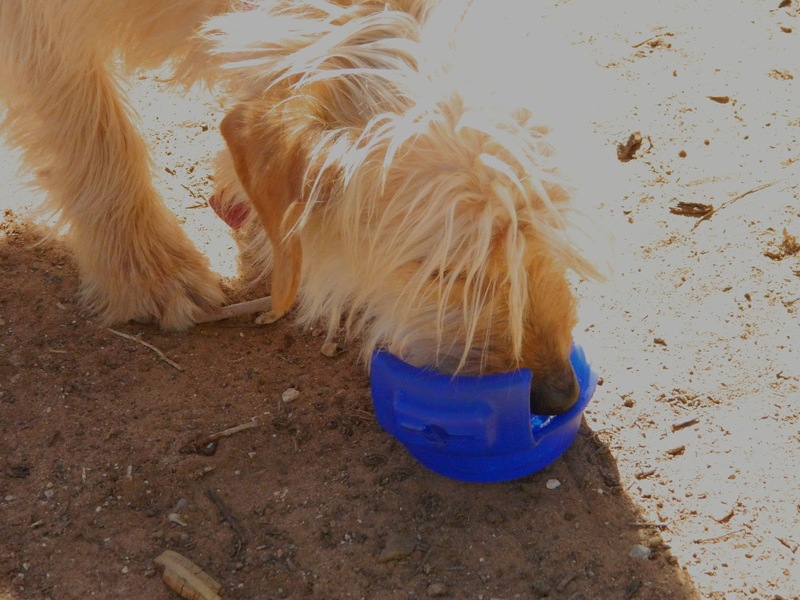 Luckily the Ruffbowl is made of durable plastic so a little play time after his drink or snack it ok. When we got our Ruffbowls we got them without the leashes since we already owned some but they are also available to buy WITH the leash which is a far better value if you don't yet own a large retractable leash. We currently only have two retractable leashes and bowls so I cannot wait to get a third so they each have their own. If you spend a lot of time with your dog on a leash this is a GREAT investment! You can keep your hands more free to enjoy yourself while having a way to provide treats and water for your pets. It can also store your KEYS! Which is awesome for when I go running with my favorite running partner Roy. If you have a furry four-legged friend please don't miss out on the chance to win your very own Ruffbowl Below! Would love to have this for the furry buddies in my house!! Snowflake and Rhino, they go everywhere with us so between their bags for food and water and the diaper bag for my son, I am loaded down. Love this idea. This would be for Leia and Oreo. I have two puppies at home. My mini schnauzers I've had for almost 15 years. This would be for my Boston Terrier named Princess! This would be for Dolly the Pit Mix.